This recipe was inspired by One Green Planet. 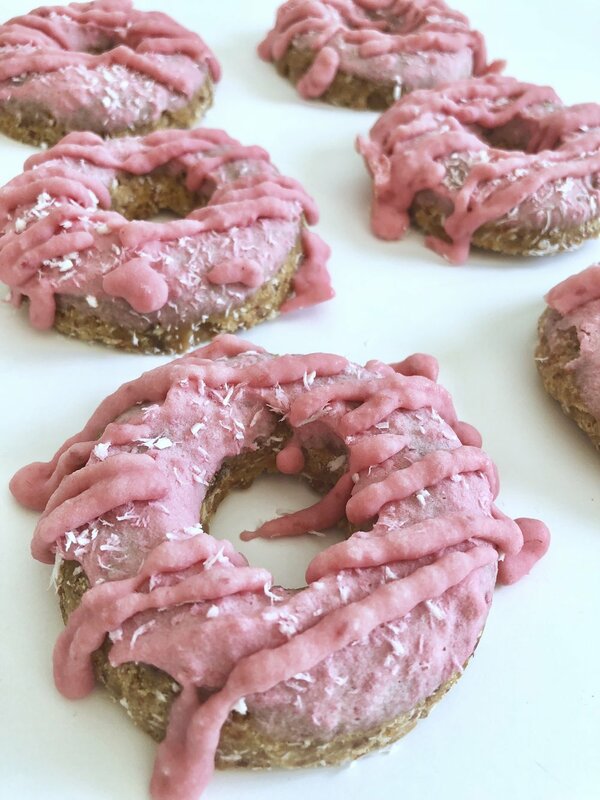 I was craving doughnuts this week, and now that I am eating more raw it was really fun to make my very first raw doughnut. This recipe is vegan, paleo and gluten-free. Soak dates in hot water for about 10 minutes to soften. Drain and add to a food processor. Pulse a few times until dates are chopped up. Add almond flour, coconut flour, coconut flakes, coconut sugar, and vanilla extract and process until well combined. Pour mixture into a bowl and slowly add maple syrup. Stir we'll to fully combine, this may take a few minutes and some elbow grease! Press mixture into the wells of a doughnut pan. If you don’t have a doughnut pan, shape the doughnuts and place them on the parchment-lined tray. This recipe makes about 20 mini doughnuts, or 7 regular doughnuts. Set in the refrigerator while you make the glaze. Place the raspberries, vanilla, coconut oil, coconut milk, maple syrup, and lemon juice in a blender and blend until smooth. Pour into a medium bowl. Gently remove the doughnuts from the pan by tracing the outside of the doughnuts with an offset spatula, and carefully lifting around the edges until they pop out. Working one at a time, dip each doughnut in the glaze bowl so one side gets coated with glaze, then place on a parchment-lined tray. Repeat until all the doughnuts are coated. Sprinkle with coconut flakes and put the doughnuts in the freezer to set the icing. Keep in freezer until ready to eat, as the icing will soften at room temperature.